He's hungry, ambitious, and loves to give back by openly sharing his process. 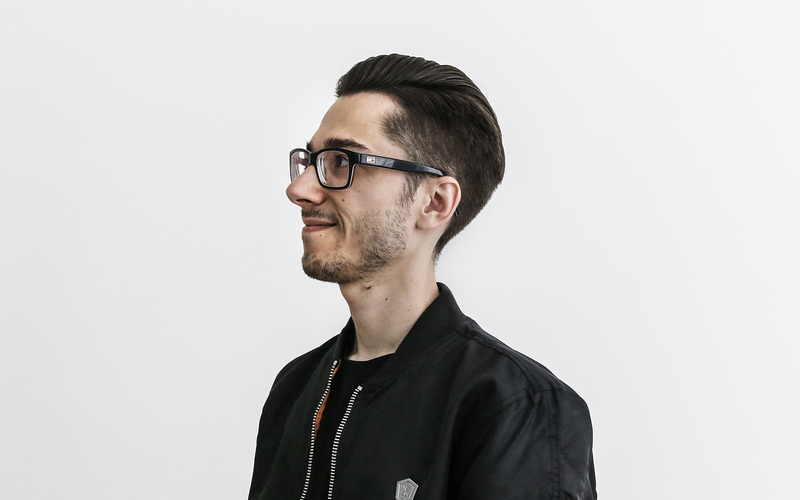 Currently, Creative Director at STRV where Ales Nesetril envisions and conceptualizes digital products for clients like Tinder, Boosted Boards, Lufthansa, and Flip. Do you have a system or process in place for building your case studies? What about documentation? Do you have a process in place for that? Any recommended tools? If you mean documentation by capturing what’s happening around me, I just do it naturally every time I do something creative. I’m saving all work in progress versions, writing down ideas on aside, taking tons of photos during the process, etc. It helps me to have a big pool of content and a “version history” which I can choose from when posting stuff on my socials or creating a final case study. Do you think about how you would build your case study from the get-go? Not really. I always prioritize my client’s needs first, because that’s what I’m hired for. Thinking about how all of the finished stuff would look like in my portfolio could be limiting for my creativity, and it could even influence my decision making during the process. I prefer to get the job done first, and then have some time to show it off publicly afterward. However, I do think about a case study in the beginning when I’m working on my own stuff, such as side projects or design concepts. It’s because a case study is often connected with the design work itself, and I really care about the form how a specific idea is communicated. I want to make it so it's easy to understand and people “get it.” That sometimes requires more planning at first. What platform to focus on and why? 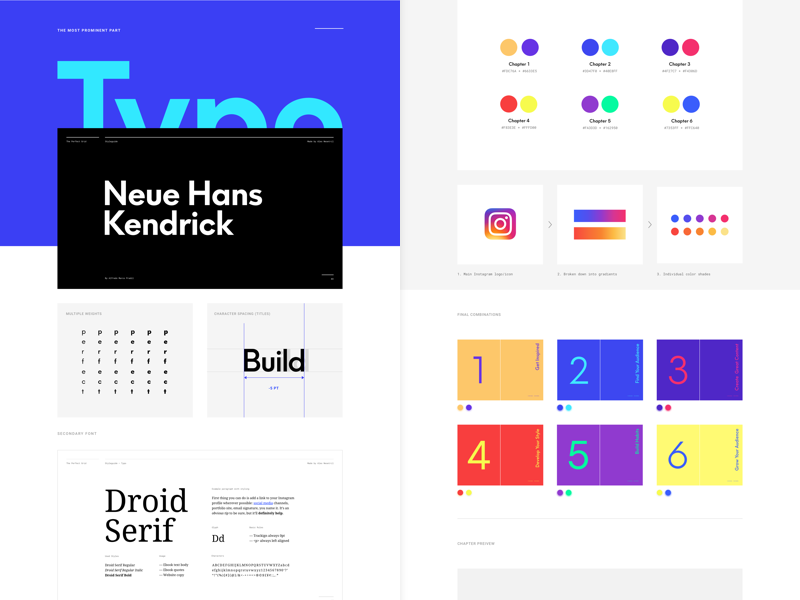 First is Behance, where I usually focus heavily on visuals and nice design previews. It mostly includes animations and all of the “fancy” design stuff from a specific project. The project is usually unique, and I design it from scratch to play around with layout and different showcase for all ideas. 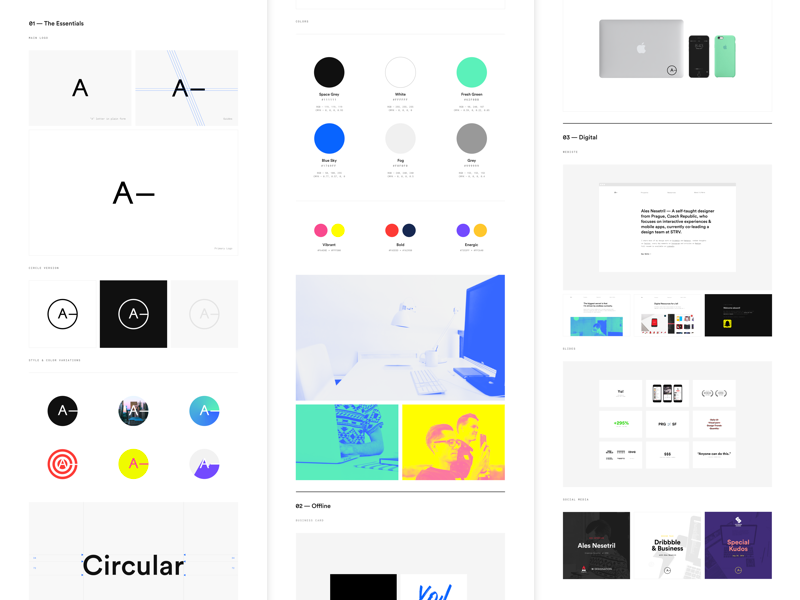 Behance is great to build your portfolio as a part of a design community. Once you put something out here it kind of spread itself, so you don’t have to spend a lot of time promoting it. But it has to be good. Second is Medium, where I love to dive into describing my ideas and solutions in details. I do more writing than designing and mostly select this format for the UX-oriented project. I think writing is great to express more in-depth thoughts and support it with just a few visual previews, so people get the picture. Similar to the first option, Medium is a platform on its own, so if you do something good everyone will notice. And of course, as a third, I have my portfolio website. In a nutshell, it could be described as merging the previous two options together and doing 50/50 from each. I only do portfolio case studies for the biggest or longest projects and wrap up a more significant amount of work/experience from a certain period of time. I only put out 2-3 of these a year, because they are tough to do as well. For example, right now I have one in works about my position at STRV. I want to map out my career path from junior designer to leading a team, and wrap-up the last four years worth of work. That’s going to be huge. In the future, I’d like to add YouTube as well and do video case studies. Something like a “documentary” movie, but not sure how to handle the whole production yet. What differentiates the different platforms? I think it’s a matter of your goals, and target audience. If you want to build a following among other designers, do smaller and more frequent releases, and keep attention from the community, then Behance or Medium is your go-to option (in combination with Dribbble and Instagram for smaller previews). You can use both to put your name out there and attract clients as well, but the conversion is not what it used to be. Don’t rely 100% just on these. Some people may not find you only by organic reach. If you don’t care about following, and your goal is just about getting clients (or getting hired), I’d recommend focussing on your portfolio website. You can design more detailed and sophisticated case studies, which are is not just about nice visuals. You can also include the whole process, story, results or key learnings, and then use the entire thing as the key to unlocking a specific opportunity. Video case studies sound interesting, where do you see this go in the future? I’d love to see people open their project or source files and talk about how they made it. 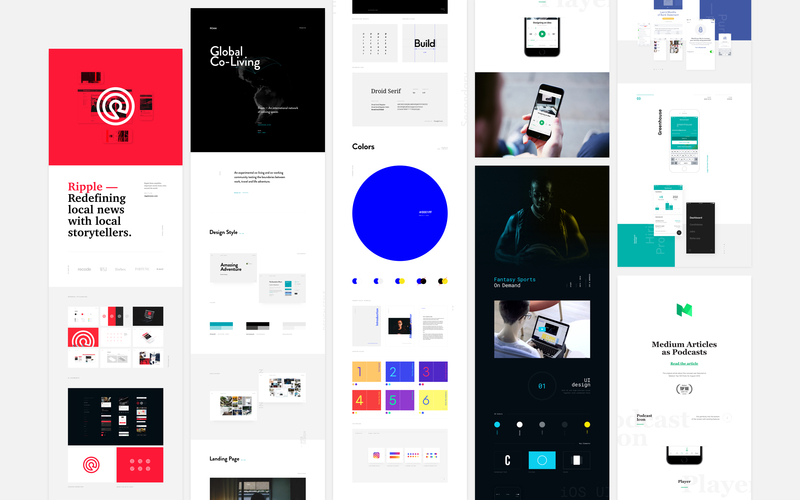 It’s not that common for UI/UX or web designers compared to illustrators for example, but I think there is a lot of value, and a new format of presenting we could adapt. It’s nice to see all of these results and finished screens, but I’m curious to find out how it was made, why it was made that way, and what was the author’s decision making. Imagine a vlog format we’re used to from YouTube applied to screen-sharing and voiceover environment. That’s how I think designers could present their work and I’d like to join (or even lead) this initiative myself. What would an ideal portfolio contain? You can live a happy life with just a front page with selected projects, about page and contact page. Everything else is nice-to-have. I see a trend of portfolios being a summary of links to other stuff you already have somewhere else. 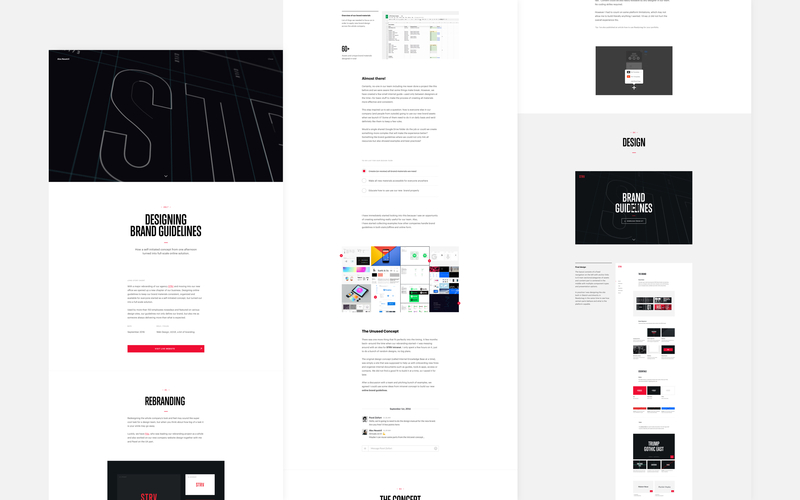 For selected projects, I’d do a mixture of links to your existing Behance stuff, articles, or maybe a few case studies living on the actual website. For about page, just introduce yourself, describe your approach/process and lists a few clients/companies you worked for. And contact, well, that’s obvious. Everything else like a blog, store with some digital goods, and other pages are not necessary unless you want to go an extra mile or have some special plans. How many long-format case studies are «enough» to have in your portfolio and do you supplement with less documented work? I’m personally trying to find balance in this recently. The ideal case I’m hoping to achieve one day is to have a detailed case study for every major topic or platform I’m focusing on as a product designer. I mean, have at least one project related to a mobile app, landing page, web app, IoT, branding, etc. to provide a relevant example and showcase my approach. We can call it a “primary” case study for example. And then, I’d create a few other smaller “secondary” case studies to fill in the remaining space, provide an additional or unique point of view and include just a few examples to highlight the most interesting parts. How do you promote your case studies? When I’m about to publish a bigger project, I usually plan a whole “launch campaign.” It may sound like an overkill, but I really enjoy it! Imagine a similar campaign to when you launch a product. Custom artworks for social, timesheet to map out what to post and when messaging selected people, etc. I do all of that to make sure the word gets out. It usually helps me to get a lot of traffic throughout the first week or so, and then I slow down the pace. If my goal is to target towards the community, I usually try to start a conversation with people who noticed it. Not only to get feedback but in general to have a quick chat, talk about how I made it or inspire/motivate others to create something similar. Sometimes other designers even reach out to talk about a selected part so that they can learn from it. The second option would be to target a specific client/brand with a self-initiated concept. After the first week when the project gets some attention, I usually approach these prospects directly via our company. Sometimes even our sales team is involved, and they take it from there. What communities do you recommend getting involved with? My strategy right now is to focus on Instagram, Dribbble, and Twitter as places where I share small previews to catch attention. These are great for everyday process and work-in-progress stuff. The community is really active on these, so you are only one post away from a great conversation. Then I do Behance and Medium for bigger projects, or when I want to present something more in detail. These are great, to sum up, more work and showcase the whole piece. Instead of catching attention (as in the first case) my goal is to bring value and show-off my high-level thinking. In general, the idea is to use smaller previews to put myself out there, and then bring the audience to more complex case studies. On top of that I’m trying to break on YouTube as well (as mentioned already), but I don’t have that much of an experience yet. For now, I only focus on doing voiceovers or time-lapses of my process. Cross-posting case studies; whats your point of view? I like it and use it a lot, but you need to pay attention to duplicate content. My favorite habit is to break down a long case study into smaller pieces so I can share it on multiple platforms, in various formats. The good thing is you can link back to the main piece of content, and keep the traffic coming for a while. What would be the best place to start? For someone completely new into this, I’d say it’s good to start small. 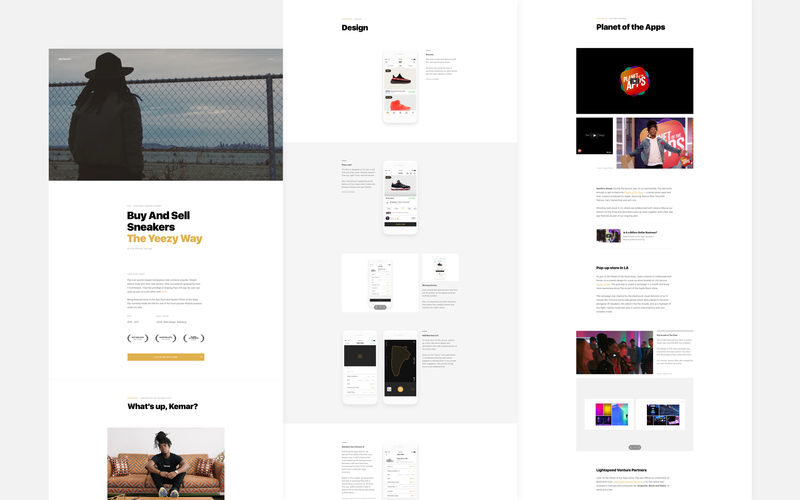 You can do your first case study just as a long image attachment on Dribbble, or do multiple photos on Instagram in a series with a description. No need to jump right-away into writing a super-long article. Take smaller steps, try out what you enjoy doing, what people notice and then evolve from that. It’s better to get going, than not start at all, by overthinking and strategize. Do you have a favorite case study and why? I remember the first case studies I was ever fascinated by were those from Fantasy Interactive, and Teehan+Lax (now part of Facebook). I remember browsing these for hours, reading every paragraph and label there to help me understand how they present the project. It was a great inspiration, which led me to think about similarly presenting my work. I had many similar sources and favorite case studies over the years, but what stuck in my head is Anton&Irene, Work&Co, Marc Anderson or Cuberto. These could do as my most favorite because everything they do is the next-level. You can search my name on any social media platform, and you’ll definitely find some content from me. Personally, I enjoy Instagram the most right now, and I try to share as much as I can about myself and my work using Stories. Then the second best source would be my website with a detailed “about” section. Also, don’t forget to check the case studies while you are there, haha!